Abrasive weeding is a non-chemical weed management tool. Weed leaves and stems are abraded by small grits propelled by compressed air. This abrasion results in defoliation, stem breakage, or tissue damage leading to weed injury or, ideally, mortality. Early research on abrasive weeding began with greenhouse studies to demonstrate that small weeds could be killed with air-propelled grits. 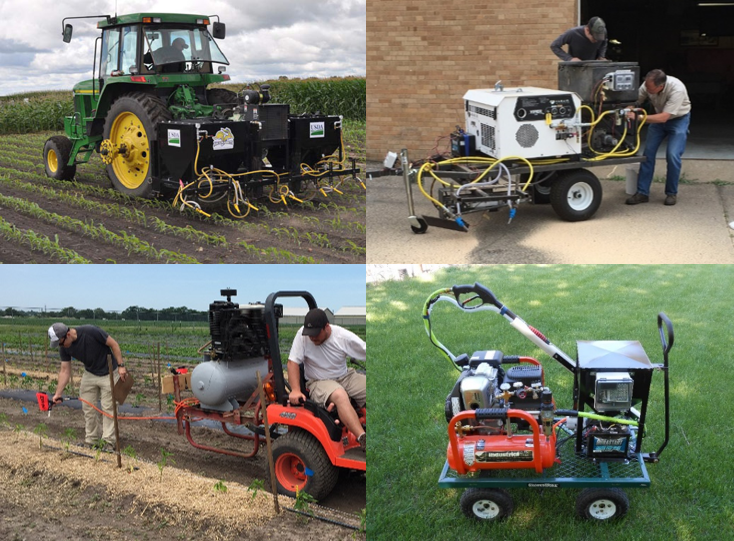 More recent research has focused on the development of grit-applicator machines and specialized nozzles, and the potential for using organic fertilizers as grits to integrate weed and nitrogen management in one field pass. Abrasive weeding is similar to flame weeding in that both are non-chemical, zero-tillage tactics for post-emergence weed control in certified organic agriculture. However, abrasive weeding is likely safer, less energy-intensive, and less damaging to crop yield when used to control in-row weeds. In addition, abrasive grit applicators can double as precision nutrient delivery tools. 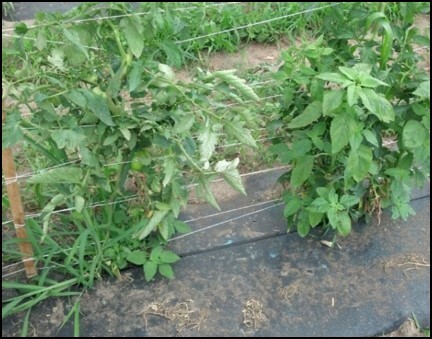 This fact sheet highlights the current state of abrasive weeding research and practice, including a summary of crops tested, applicator design considerations, expected weed control, possible grits, and economic feasibility. Corn and soybean plants can be sprayed as early as the V1 growth stage without any reduction in crop yield (Erazo-Barradas, 2017). 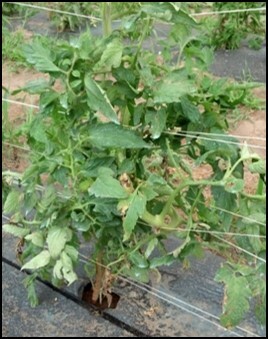 Tomato and pepper plugs can be sprayed one week after transplanting. Stem abrasion is visible, but grit application does not reduce growth rate or yield (Wortman 2014, 2015). Small fruit liner plants (raspberry, for example) can be sprayed immediately after transplanting. As the weed community shifts from annual to perennial species during the establishment phase, abrasive weeding will become less effective. Additional research in broccoli, sweet potato, edamame, snap bean, and hops is ongoing. Most crops with an upright stem architecture seem to be compatible with abrasive weeding. Grit applicators consist of three basic parts: 1) air compressor, 2) grit hopper and meter, and 3) nozzle and tubing. Air compressors: Reciprocating air compressors (available at hardware stores; suggest >5 HP engine, 155 psi max pressure, >5 CFM @ 90 psi) are suitable for single-nozzle, hand-held grit application, but a rotary-screw air compressor is required for continuous application of grits within a crop row with multiple nozzles. Hopper and meter: For grit applicators available at a hardware store, grit is either siphoned from the hopper or delivered via pressure or gravity. Unfortunately, these systems are susceptible to clogging when irregularly-shaped organic materials are used as grits. Our team developed a motor-driven grit meter to prevent clogging and provide more precise control of application delivery rate. Nozzles and tubing: Nozzles available at a hardware store can be effective, but grits can often clog the small orifice that accelerates air, so our team developed a special nozzle to prevent clogging by bypassing this orifice. Each nozzle requires two different tubes: one carrying compressed air and the other carrying grit. The grit meter and nozzle developed by our team are not yet commercially available. However, if you are interested in purchasing a custom meter or nozzle for agricultural grit application, please contact Sam Wortman (swortman@unl.edu). Grit applicators have been developed for different production scales and cropping systems, ranging from 1 (bottom) to 8 nozzles (top left). Photo credits: Frank Forcella, USDA ARS: top left and bottom right; Sam Wortman, UNL: top right and bottom left. Research suggests that two applications of grit, approximately 10 and 24 days after seeding or transplanting, can reduce weed biomass in the treated area by 50% to 95%. However, actual weed suppression depends on weed community composition (annual broadleaves are more susceptible than grasses and perennials) and abundance, weed growth stage (small weeds with fewer than three true leaves are most susceptible), environmental conditions (rainfall events stimulate additional weed germination), and cropping system (a dense crop canopy may reduce weed regrowth after grit application). Weed suppression is also a product of how long a weed is exposed to abrasive grit; driving or walking slowly (<1 mph) can improve efficacy. Table 1. Weed control (%) after two grit applications, measured as a reduction in weed biomass relative to a weedy check in grain and vegetable cropping systems. Any OMRI-listed material (check with your certifier) can be used as an abrasive grit if it can be ground or milled to a mesh size between 40 and 20 (0.015 – 0.035 inch diameter). Excessively fine or lightweight grits should not be used as they increase the chance of clogging the applicator nozzle and create a dust inhalation hazard. For example, greensand and rock phosphate organic fertilizers should not be used due to excessive dust. Table 2. Advantages and disadvantages observed for different sources of abrasive grit. The cost of abrasive weeding is similar to that of hand-weeding, but it can reduce labor needs four-fold. The largest expenses of abrasive weeding are the applicator and grits. We estimate that the cost of materials for the eight-, two-, and single-nozzle applicators is $10,500, $7,100, and $1,200, respectively, and the cost of most grits ranges from $0.10 to $0.80 per pound. Thus, profitability increases with the number of acres farmed and when the cost of grits is low (which requires grits be purchased by the ton or produced inexpensively on-farm). Organic fertilizers as grits may increase profitability by reducing nitrogen input costs. Overall, abrasive weeding is most economical in high-value specialty crops where manual hand-weeding costs are typically high and potential revenue loss from weed competition justifies an intensive, weed-free management approach. Weed growth 1 month after final grit application to the planting hole area in tomato. Left: No grit application. Right: Two applications of walnut shell grits. Photo credit: Sam Wortman, UNL.